Massawa Airways (Massawa) has been cleared to operate its sole MA60, E3-AAV, by the Eritrean Civil Aviation Authority (ECAA). The announcement comes after talks between Xian Aircraft Company (Xi’an Yanliang) and Eritrean officials in Asmara in November which lead to the aircraft’s type certification in the Horn of Africa country. With Beijing’s attractive financing options and the possibility of a “buy two get one free” deal also available, the turboprop is gaining traction in Africa with its most recent order coming from an undisclosed buyer from Djibouti (believed to be the Force Aérienne Djiboutienne) in September. For additional related news read here. Ere is rising up ! Sky is the limit ! I just wondering the tequamerti 's fate to hell . Gual Hade Lebi haftey …I don't even think the Sky is the limite. 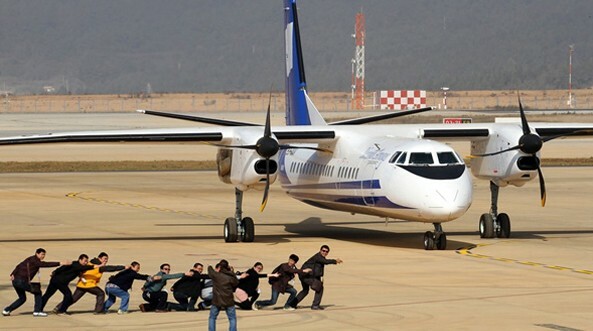 Have you got a problem with Chines plane? China do make Space Rockets too! You don't have to wait Eritrea woudl be making one too! I am talking safety here. What is their safety record. They are making anything these days thanks to reverse engineering but it means nothing to me. I value safety first and I won't fly in these planes. No one's asking you to fly in them. Do you know which plane maker has the highest incidence of malfunctions and crashes? AdGi z'eyBelUs b'Qli yEneEq !!! A perfect sign for a healthy and functioning private sector reforms going on. Aviation like telecommunications are used to be caxh-cows for government and never been liberalized. But now both have opened their gates for privatization. That is music to e every nationalist Eritrean less the tequamerti oppps ……. teqawemti. You ain't seen nothing yet. Ertra kihalfela iyu. The best is yet to come! With sanctions about to be lifted, all the foundation work completed, the country and its economy are ready to take off! Long Live to the Eritrean People! Another sequel to the "Eritrean Aviation Industry" saga. The list is now Eritrean Airlines, Eritrean Airlines Reborn, Red Sea Air, Eritrean Airlines Re-reborn, Massawa Airways . . . . . what is going on here people? People like you know only how to give up. We are Eritrea and we keep on marching forward. Next Year Eritrea is going to build it's own Air lines. Think further ERITREA ADEY!!! Pesident of Zimbabwe Mugabe refused to fly MA60 for safety reason and what does this tell you my Eritrean brothers and sisters??? THE PLANE IS FLYING WALMART. BezeQzeq, Long time ago I was told the same thing about Mitsubishi, Samsung, Hyundai and Kia. I am sure you own one of them now. Tell me if this Aircraft ever crashed. HMMMMMMMMMMM, VERY INTRESTING!!! IS THAT WHY all his military hardware 'chinese"? If I was the one who would make the purchase decision I would go for Bombardier Q200. Safety before price! Does Tigray have any airplanes? Is it mostly stolen from the Ethiopian State or does Tigray have its own airplane. TIgray is so poor it can't even afford a helicopter. Since I am not from Tigray I couldnt answer your question. You could submit your question in the Tigray news media if you want to know the answer. And how many times did a "the western nightmare liner" went up into flames? On 10 June 2013 Merpati Nusantara Airlines flight MZ6517 from Bajawa to Kupang, with 50 people on-board landed hard at Kupang airport in East Nusa Tenggara, Indonesia. -On 10 June 2013 Myanma Airways flight UB309 from Mawlamyine, Myanmar carrying four crew members and 60 passengers swerved off the runway upon landing at Kawthaung. In August 2013 the New Zealand Government also issued a statement advising tourists to not travel on Real Tonga's MA60 on the grounds that "this aircraft has been involved in a significant number of accidents in the last few years", and the type "is not certified to fly in New Zealand or other comparable jurisdictions" What does all this tells you Aba Tirreg??? Carrying a crap smasung phone in your pocket and flying in a junk bird that has technical flaws is not the same. Bazeqzeq, you sure like to copy and paste, well for your info the most common cause of aircraft crashes is a pilot error for not following safety procedure. How about the new Boeing 787 the most advanced Aircraft so far ?? "Buy two get one free option" what is it a soap? Mercato hone iko negeru.